a) Student has misunderstood how to use the parity of the force components. d) The student has assumed equilibrium rather than acceleration. 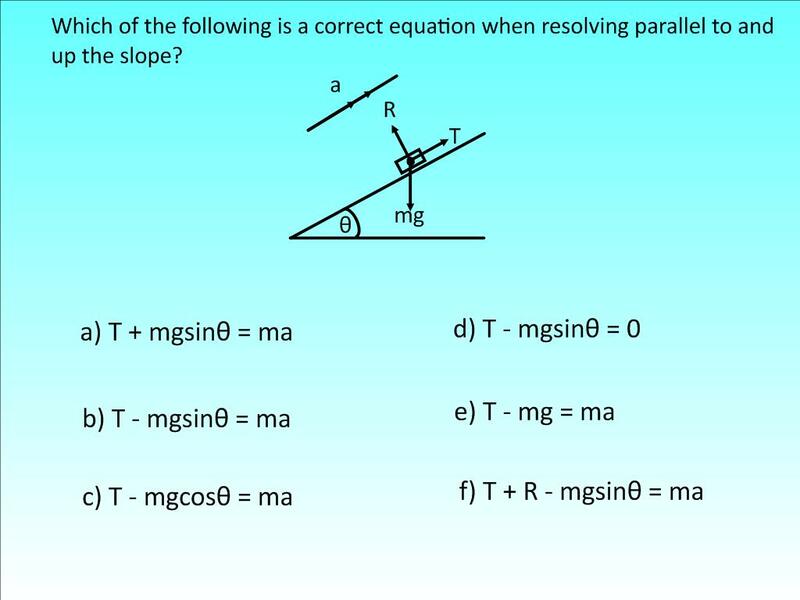 f) The student has not understood that perpendicular forces have no effect on the resolution. More to follow soon I hope! This entry was posted in Classroom, General Maths Thoughts, Hinge Questions, Lessons, Pedagogy and tagged Conferences, General Maths Thoughts, Hinge Questions, Lessons, Mechanics, Pedagogy. Bookmark the permalink. Great post. I do a lot of work helping university instructors use peer instruction (“clickers”) in their classes. Sure, there are technical things to learn and best practices for running peer instruction, but its success comes from a good question. When I help instructors create these multiple-choice questions, I stress the importance of the incorrect choices – each answer should let the instructor diagnose what/how the students are thinking. That way, the instructor can immediately address the mistaken or incomplete understanding. Just like your hinge questions! Hi Peter, thanks for the comment – I fully agree that the questions we ask are hugely important – I find it so frustrating when I look at student responses and all I can tell is that they weren’t right. Part of the difficultly and satisfaction of teaching for me at the moment is trying to find the right questions. I’m interested by what you mena by ‘clickers’ when running peer instruction?